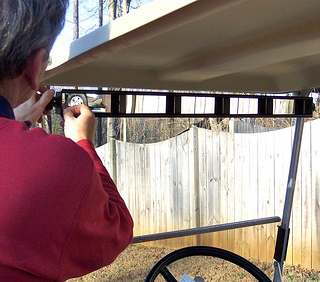 A golf cart mirror is an important accessory for your golf cart. This golf cart part should be on every golf cart - especially if you live in a golf cart community. Since most of today's golf carts are electric - you can't hear them coming up from behind you - but you can see them with a rear view or a side view mirror. 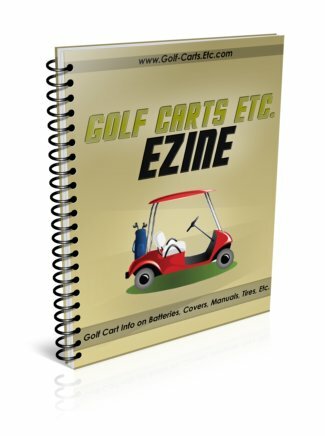 You can purchase a universal mirror- meaning they will work on any golf cart model or a mirror that is specific to your model of golf cart. Often the mirror will be a universal mirror but the brackets will be specific to your make and model. Check to see if the mounting hardware is included in your purchase. Some of them require a trip to the hardware store for mounting brackets or screws. One model mounts on the front roof support with an adhesive strip and affixes to the roof support. 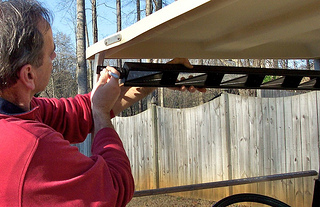 A golf cart rear view mirror is a very inexpensive and useful Yamaha, Club or EZGO golf cart accessory. This mirror on the right is a universal mirror that fits Club, Yamaha and EZGO golf carts. You will need to drill a few holes to install the panel ones. Some drivers prefer a single large rear view mirror like the one in your car. This one measures 16.5" wide and mounts with a metal bracket. It fits all major golf carts makes. A side mirror works just like it would if you were driving a car. It's just another way to see what's going on around you. Our golf cart paths are also filled with people who are running, walking, biking and rollerblading. A side mirror is another way to drive safely on the paths. Most side mirrors are universal meaning they will fit on any make, year or model golf cart. They can be mounted on the left or right side and do require some drilling. Usually they are mounted on the roof support. This one is of course adjustable with non-glare glass. The requirements for street legal golf carts vary - but most often do require side mounted mirrors on the driver and the passenger side. These side mirrors have LED turn signal and driving lights with markers on the mirrors. The kit includes driver side and passenger side mirrors, mounting hardware and instruction. The mirrors are a universal fit and easily mounts to the front strut.DIY kit requires 12v wiring knowledge. You will be a safer driver when you can see what's going on behind and around you.